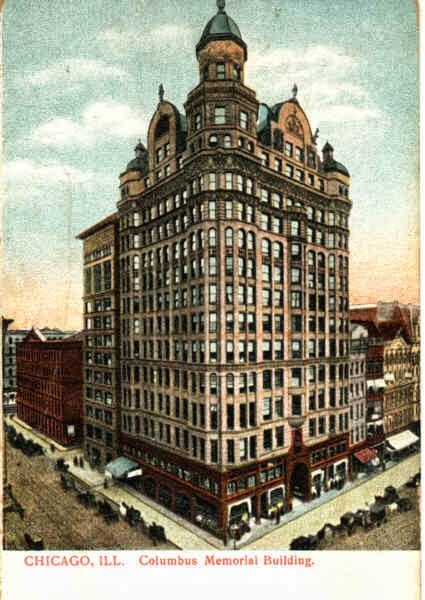 W.W. Boyington designed this 14 story building that was built in 1893. This was the same year that the World's Columbian Exposition was held in Chicago. It was located at the southeast corner of State and Washington Streets. The Venice and Murano Company made the two enamel mosaics that decorated the rear wall of each store on the State Street entrance. One showed the Landing of Columbus and the other the Columbus Before Ferdinand and Isabella. Each panel measured 8.5 feet by 16.5 feet and they were commissioned for the Expo by financiers of the building, law partners Van Higgins and Henry Furber. They were moved to the building in 1894. 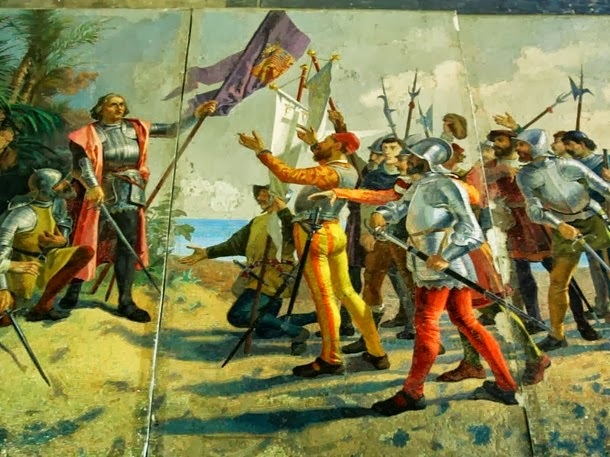 The building was destroyed in 1959, however, the mosaics, as well as a 10 foot statue of Columbus and numerous bas reliefs were proposed to be donated to local art organizations. However, the Art Institute rejected the mosaics both because of their size and their dilapidated condition. They were consequently moved to a storage facility. In 1976, the Landing of Columbus panel was installed on the south wall of the lobby of Columbus Hospital. However, tiles from the other panel had been used to repair it, and it had also been cut into three separate panels in order to fit. The firm used to repair the mosaics - Conrad Schmitt Studios in Wisconsin - was allowed to keep the remaining mosaics. 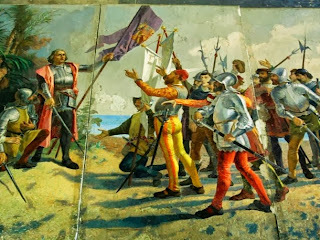 The Landing of Columbus was on display in the hospital for about decade, until the next round of renovations. It was consequently removed and stored, until it was also given to Schmitt Studios. As of 2012, the three restored panels were still owned by the Gruenke Foundation for the Arts, which is a non-profit organization set up by Schmitt Studios. Barr, Sheldon. Venetian Glass Mosaics: 1860-1917. London: Antique Collectors' Club, 2008. 126. Columbian Exposition Dedication Ceremonies Memorial. 1893. 296. Huebner, Jeff. "Kept in the Dark." Reader. July 8, 1999.